GLOGIRLY: What Did Santa Katie Get Waffles For Christmas? Wow! At least you you didn't have to wear them Katie! well bummer. A flying Waffles would have been really cool..
hey wait.. I've seen him fly very high in deed before.. maybe he just wasn't in the mood this time..
OOh what a delight. I'd love to win - but maybe I would be able to donate to a colder pal in the northern hemisphere, like my pal Lillian, could I do that, she has two new kitties and needs to be warm to cuddle them heh heh!! He did look kinda cute in them, though. Allie: YES, Maxie. Maybe you should go HELP HIM. And take the Bra-- err, ah, Faraday with you. You could be the Wrigh-- err, Wrong Brothers and invent reindeer games. Or something. They look cute on you, Waffles! What did you give Katie?!? Just dropped by to say Merry Christmas and a Happy New Year. Oh, and Waffles, I'm sorry you got duped into getting Coal for Christmas. 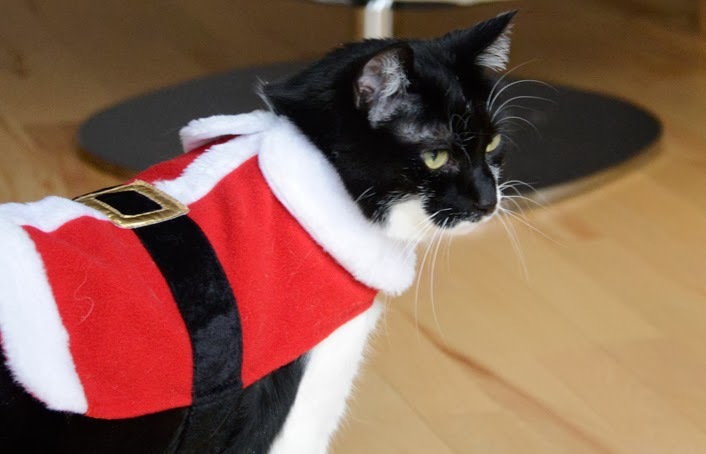 Santa must be a real cat... Oh wait, in your case, she is! Waffles, we're sure that would have been a good look for you. Come baaaaack! 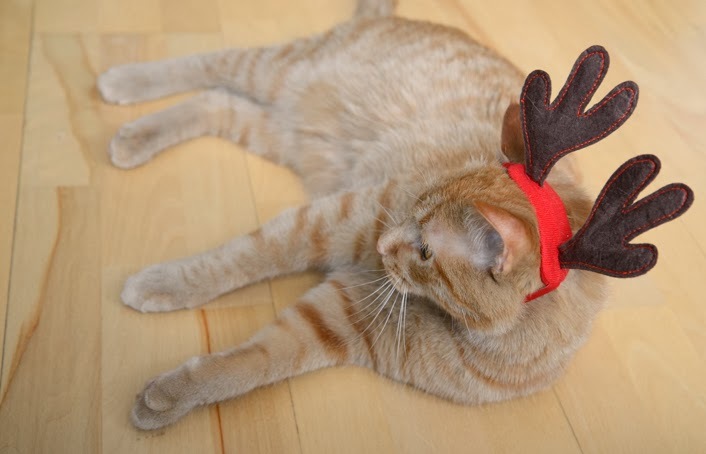 Waffles makes a great reindeer. 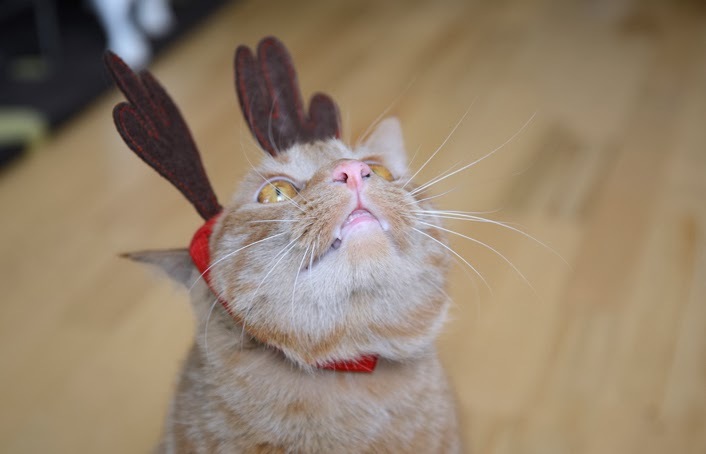 Maybe you can give him a red nose to go with the antlers and he can be Rudolph. Maybe he needs more practice? Maybe Waffles needs a cape. Waffle, don't give up so easily, keep trying! Waffles, you don’t look vey happy in that last pic. What did YOU get Katie? Hope you and Waffles stop by Purrfectly Pickles....there's a little something waiting for you there! too bad they don't work waffles. .. They look cute at least! At least Katie didn't "send you flying"! Waffles I think you can fly without those. LOL. You two are so funny. I was so looking forward to seeing you fly Waffles. I think you have to put them on and then jump off of something in order to fly. Help him Katie! Katie we heard Momma snort when you told W2 those antlers could make him fly. Waffles, just wait 'til you get your Big Boy Lip Freckles like me...THEN those CATlers will fly you around the townhouse! Waffles! You weren't doing it right, Buddy! You gotta FLAP 'em up-and-down and up-and-down, real fast. Then you'll take right off! I swear! Heh heh. You gave him broken antlers for Christmas? 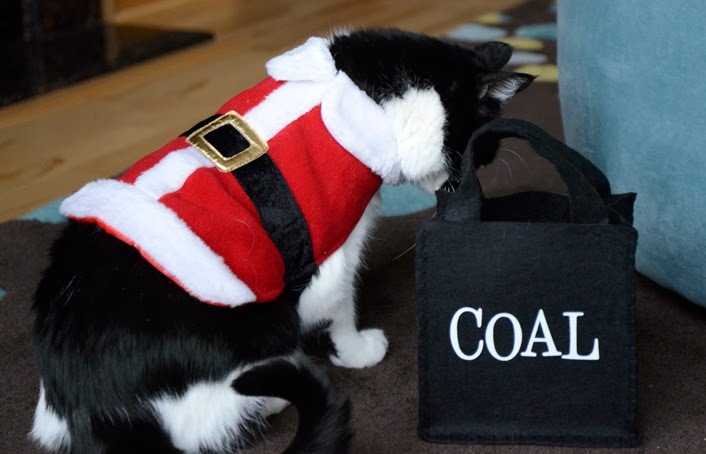 We think Waffles would have preferred the coal. At least he could have made a mess in the house. 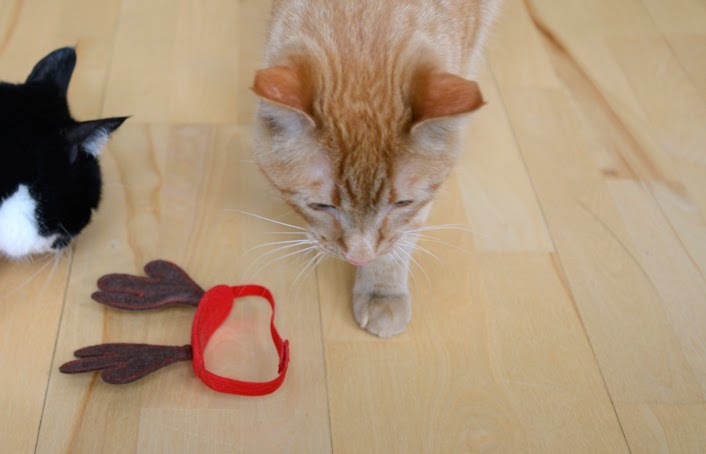 Waffles buddy, you were supposed to wear those while standing on the top of a cat tree, flap your paws, and jump pal! Woohoo - you would have been flying. 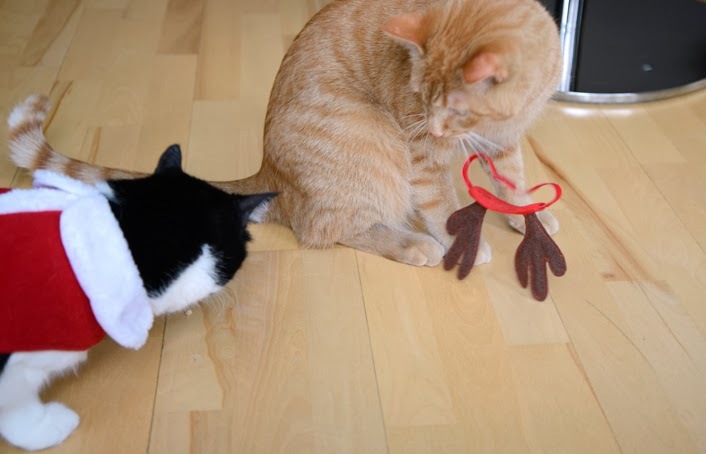 Yep, we think theese ones are defective...did you get a gift receipt with them, Waffles? oh those outfits! 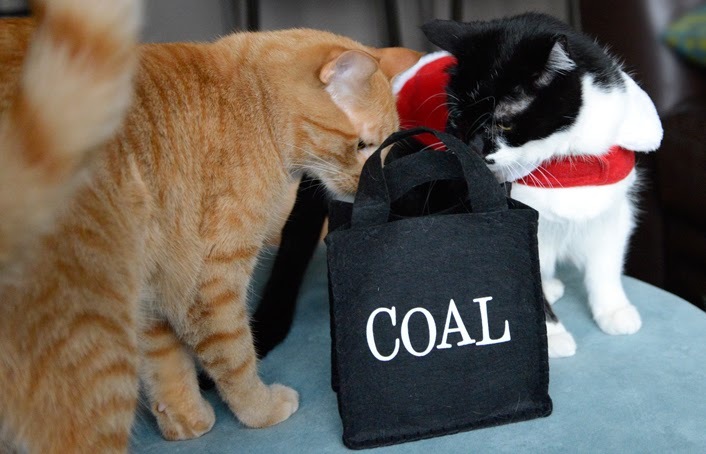 hope you really got more than coal & had a great Christmas!